This is a very minimalist and flexible pattern. 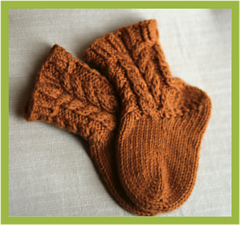 It is written for two circular needles, but can easily be adjusted for double-point needles or magic loop. 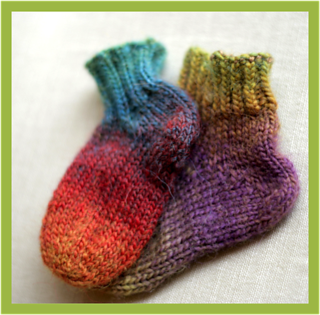 It should be perfect for using up some leftover sock yarn, or for experimenting with a new one. 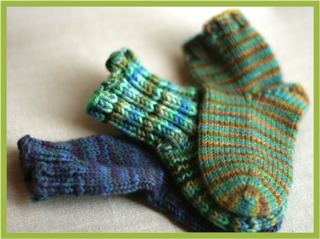 The sizing depends on the weight of yarn you use and is very approximate. Those darn babies come in so many sizes! Proceeds from the sale of this pattern go to the college fund of our little friend who we nicknamed “Sammy” (after our favorite TV show) before she was born.